Corporate America still tends to insist it has no obligation to anyone but shareholders. It is time to put an end to this attitude–and it will be up to consumers to do so. We cannot tolerate the hypocrisy of corporate attempts at social responsibility that try to save and protect with one hand while the other hand destroys. At the dawn of this 21st century, the problems of the world remain massive. Nearly 4 billion people live on less than $3 per day, 1 billion are undernourished, and roughly 8 million children die per year before the age of five, many of whom succumb to illnesses that could have been inexpensively treated or prevented. Even without the Great Recession that now encumbers nearly every nation of the developed world, the disparity between the wealthy and the poor has been rising relentlessly. To date, we have relied on governments and philanthropies to attend to these problems. However, it is clear these two pillars of social transformation can no longer meet the scale of our global crises. Government-sponsored social initiatives are increasingly hampered by politics, partisanship, limited financial resources, corruption, and bureaucratic inefficiencies. Due to the recession, nonprofits are rapidly losing donors and billions of dollars in funding, causing many of them to cut back severely on their programs, while others simply close shop. It is time for corporations to accept their social responsibility and become a “third pillar of change” in the world, partnering with governments and philanthropies to meet these challenges. Some might claim that U.S.-based corporations are already doing this, given that they contribute nearly $20 billion to causes through direct charitable contributions and corporate foundation awards. But such numbers are highly misleading because, in reality, most corporations donate only about 1 percent of their total pretax profits to charitable causes and it rarely exceeds 1.5 percent. By comparison, corporations generate trillions of dollars for their shareholders, and top corporate executives receive salaries and bonuses in the tens of millions. The proceeds generated from corporate CRM campaigns are very small compared to the profits they generate for corporations. Top corporate executives remain largely uninvolved in their commitment to serious social transformation. Taken together, CRM and other forms of corporate charity ultimately reflect an obstinate resistance on the part of corporations to be truly responsible citizens. Adhering staunchly to the economic philosophy of Milton Friedman, Corporate America still tends to insist it has no obligation to anyone but its shareholders. Executives and boards of directors continue to act as if their only responsibilities are to maximize returns for their stockholders. It is time to put an end to this attitude–and it will be up to consumers to do so. Just as they did with the environmental movement, consumers must begin pressuring corporations to accept a far greater degree of responsibility for the role they play in this interconnected, globalized world of the future. Corporations need to recognize that they have a moral and ethical duty of social responsibility in exchange for their license to operate. The future of their profit must therefore be linked to serving higher purposes in the world. As observed by the noted European philosopher, Slavoj Žižek, we can no longer tolerate the hypocrisy of corporate attempts at social responsibility that try to save and protect with one hand while the other hand destroys. In order to truly become a third pillar, corporations must adopt four new behaviors. First, as long as investors demand that they maximize profits, corporations must allow society to deduct more of the costs of the negative externalities they create that are never counted in the corporation’s tax burden. These include such ramifications as pollution, traffic, defense expenditures, dysfunctional families, obesity, and crime. Second, they need to acknowledge and act upon their responsibility to help create a healthy society, because capitalism can survive only if there is prosperity for the majority of people, not just among a small group of the wealthy elite. Third, as Bill Gates suggested in his vision of “creative capitalism,” corporations must search for new ways to define profit by doing business even in the world’s poorest nations. Corporate responsibility and profit can no longer be thought of as mutually exclusive. Finally, corporations must wake up to the reality that we now live in a complex, globalized, interconnected world. They cannot continue to cling to anachronistic ideas about capitalist self-interest that are no longer valid in a world of 7 billion people vying for the same resources while sharing our single fragile planet. Global competitors among the emerging nations, the new tools of communication and connection, and the growing power of citizens and consumers seeking a better world for everyone are going to alter the corporate landscape. Corporations that fail to embrace a new paradigm of social responsibility will be overpowered by those that understand its critical importance in the new world of the 21st century. This essay appears in Brian Reich’s new book, Shift & Reset: Strategies for Addressing Serious Issues in a Connected Society. 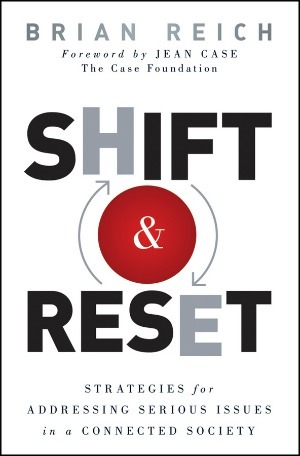 Shift & Reset provides organizations and individuals with essential strategies to take advantage of rapidly changing technologies in order to shape policy, build capacity, develop talent, improve marketing and promotion, fundraising, and develop partnerships for organizational success.